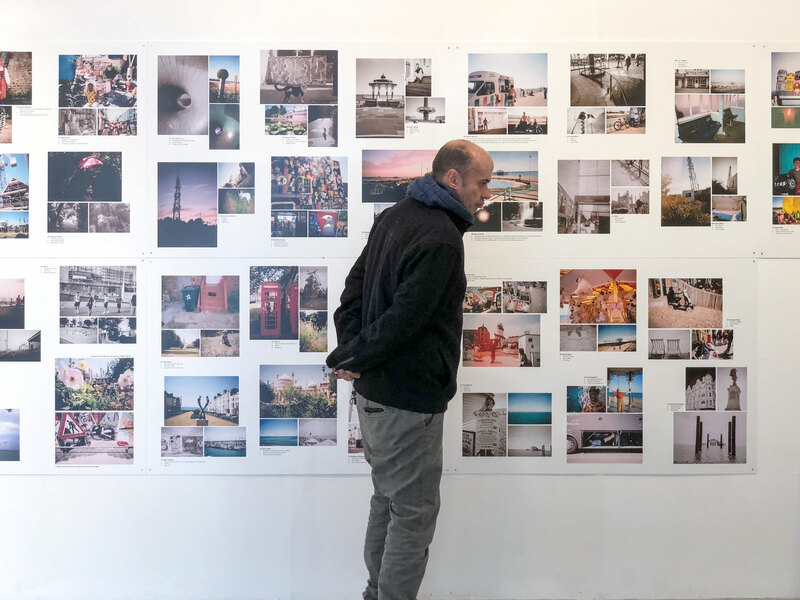 Collaboration and collective working are the core aims of Brighton Photo Fringe and, in all, they presented eight Collectives this year, selected from open submissions and showcasing new photography in all its forms. An afternoon at Phoenix, Brighton. 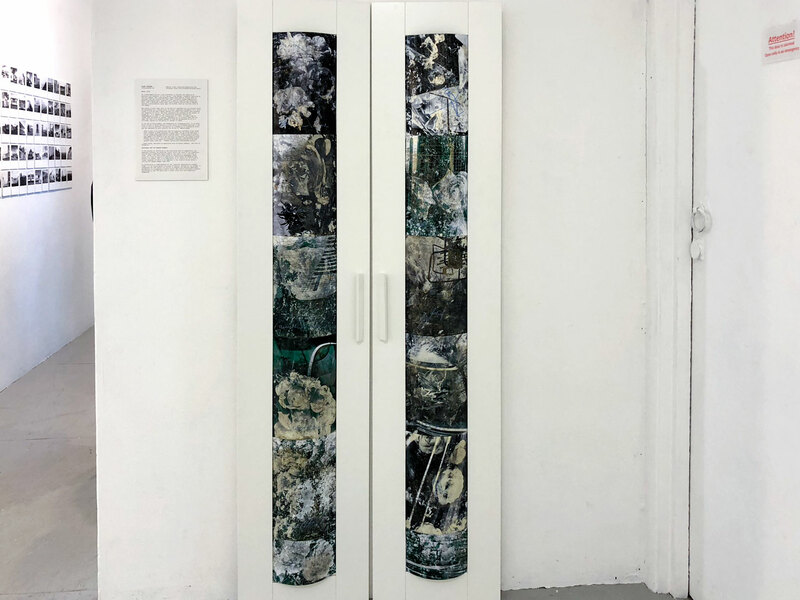 Friston Forest Glitch – Exhibited in the Artefactcollection which comprised work by artists from Metro Imaging’s Mentorship Programme in addition to Metro’s own team. 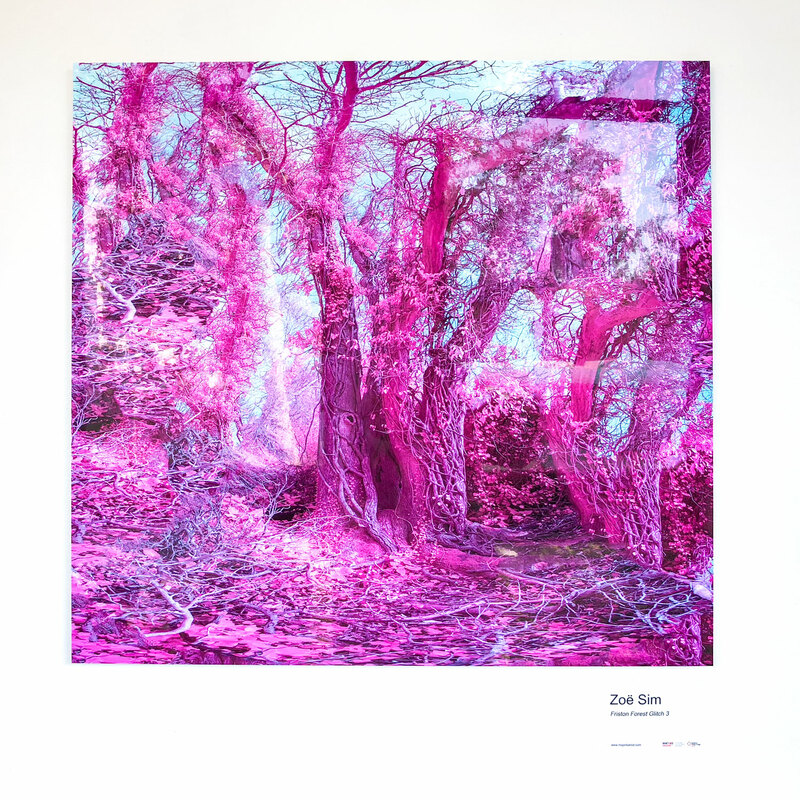 Zoe uses infrared photography to oversaturate landscapes into pink worlds, believing that “…the aesthetics of pink can trigger contradictory emotions because pink is associated with many politically charged stereotypes. Zoe’s use of pink connotes a futuristic environment where technology is beginning to seep into nature, whereas I used near-infrared in Assignment 1 to signify what we are unable to see in the world with our normal vision. Furthermore, Zoe also uses asymmetric and jagged shapes to add to the surreal and ‘uncanny’ effect of her sublime. There is an interesting article here about some earlier work where she used pink in a different way to create a more dream-like world and critique female objectification by mimicking classical poses from paintings – I was reminded here of the work of June Calypso and her use of pink. Now feeling more ‘at home” I went off to explore the other rooms. In this series I have merged 3 elements resulting as the 4thelement. The 2 photographic layers were made by winding back an analogue film and retaking the next layer, creating random compositions. Roses from Preston park, layered with a familiar suburban and industrial walk, with a textured traced layer from a plastic Braille map of England leaving a gold/graphite layer upon the surface, make up the total form of the images. 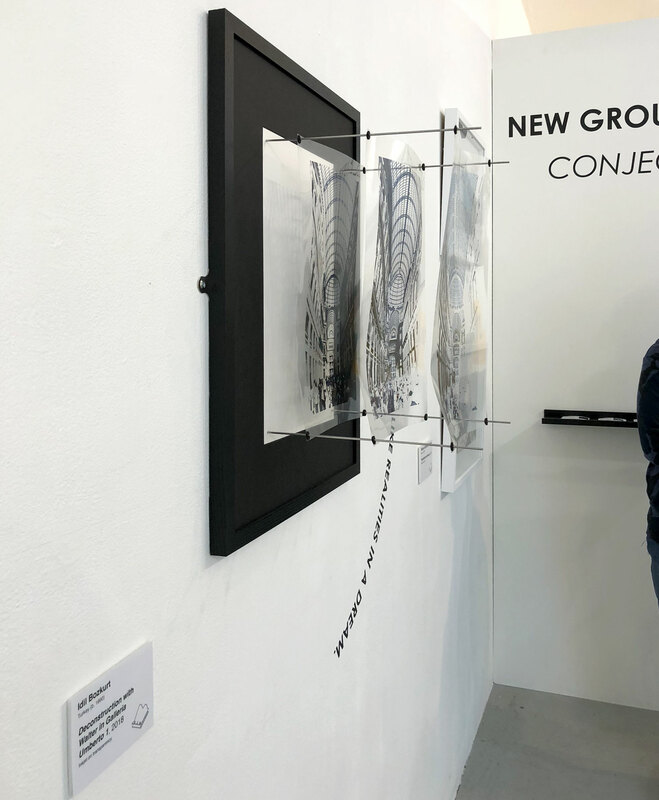 Also exhibiting as part of the Ontic Collective. 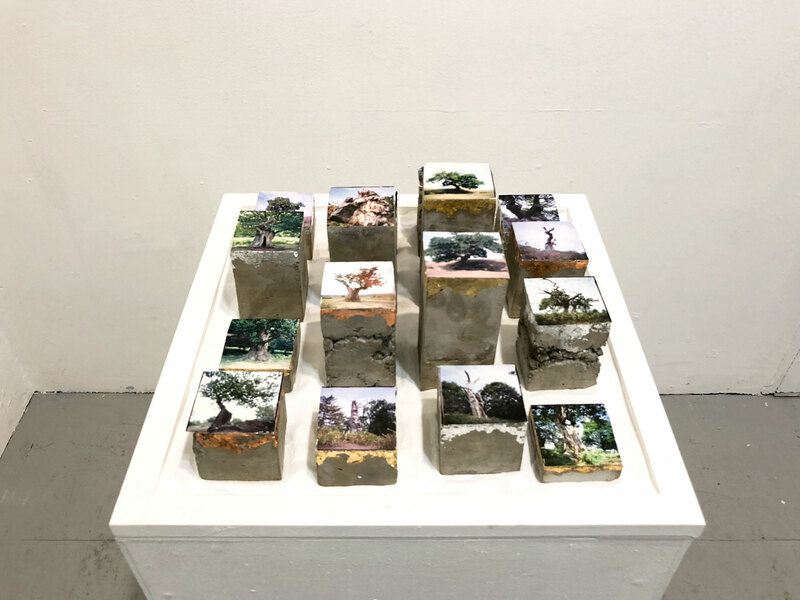 An installation of framed prints on the wall and small images on top of variously sized ‘blocks’ arranged on a plinth. The narrative behind the presentation of these pinhole photographs concerns the execution of Lady Jane Grey in 1554 (see also) She was beheaded on Tower Green and the ground keepers at her home are said to have marked the occasion by pollarding the oak trees on the estate in a symbolic beheading. A chilling event and a very effective presentation. Although this work does not appear on David Cundy’s website it does on his Instagram feed . Whilst looking at his website I also took note of his use of image and handwritten text. 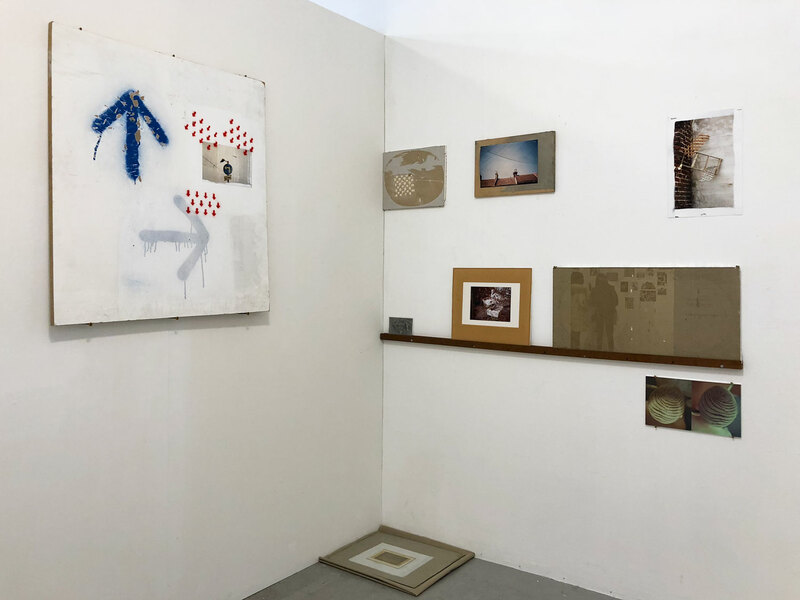 A collective pod comprising two different exhibitions where two artists each brought a developed body of work and, over an afternoon, attendees discussed and contributed to the decision making in curating and installing work. This was the outcome of one of the events. I liked the idea of such an interactive event and a way of involving viewers in the work. I think it was the work of Tom Heatley as I recognise the roof and chimney pots. 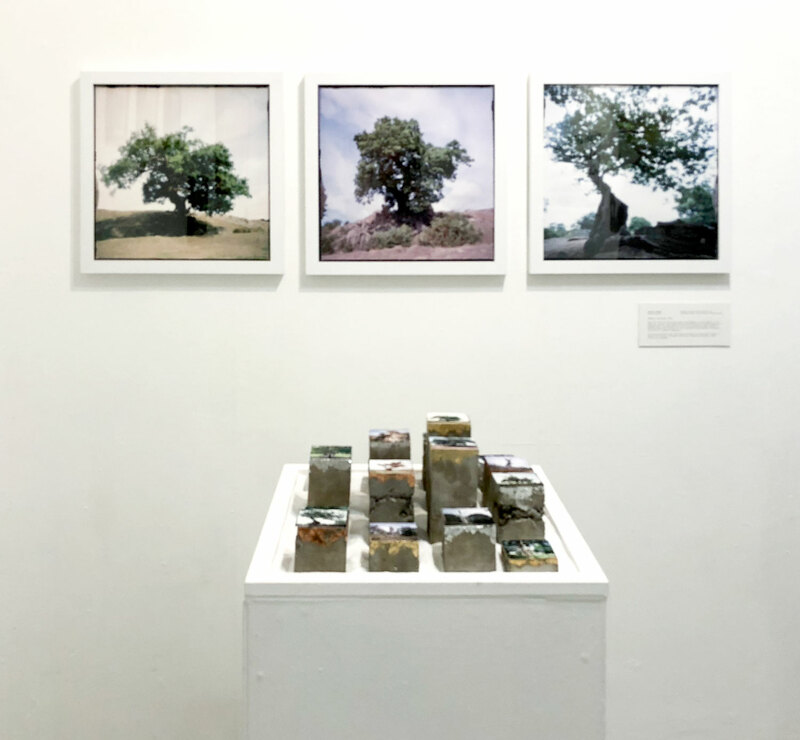 This collective invited viewers to, “a space where we speculate and delve into the ‘conjectural’ facts regarding the fluctuation of the natural, urban and cultural environments. This is a representation of a shopping arcade in Naples, built between 1887-1891, designed by Emanuele Rocco and named for Umberto I, the then King of Italy. 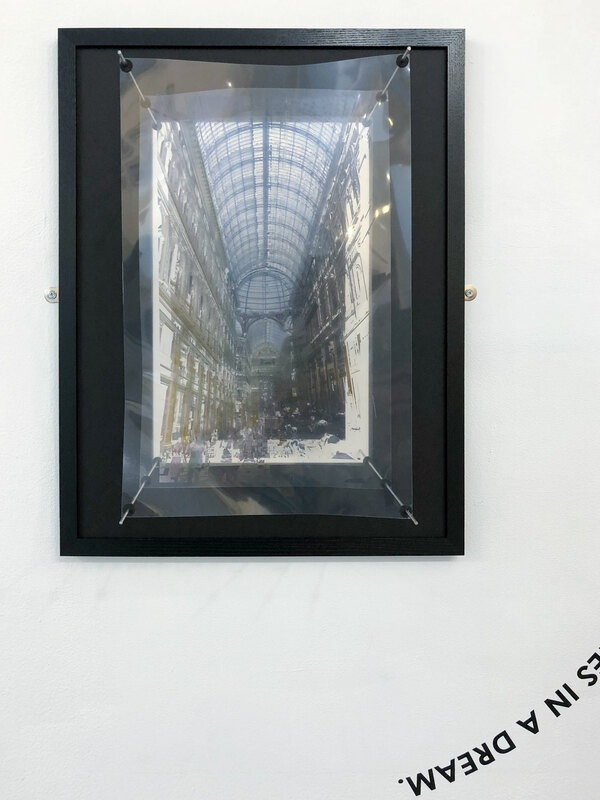 It’s a one-off Installation piece – suspended transparent prints on a frame-based substrate I found it fascinating and had to keep going back to have a look at it. Peering through the stacked translucent layers, trying to work out how it was done and admiring the 3D effect. Also for sale at £10,000 in Phoenix Brighton online shop I’ve just discovered. I think it’s a very effective and different way of representing depth in an urban landscape. 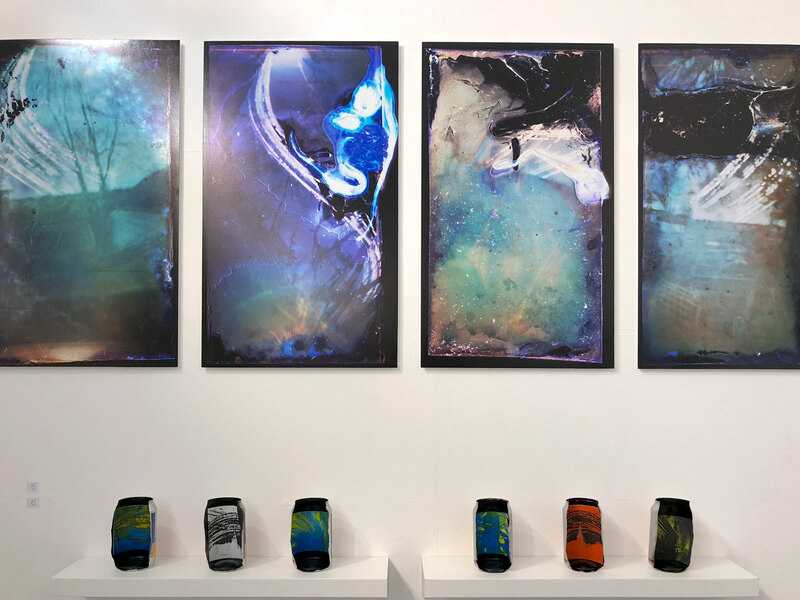 Their show brought together artists who ‘point’ their cameras at the sun and included alternative processes such as pinhole solargraphy, lunar photography, motor-controlled time-lapse and chemograms. It was good to see work displayed by many of the photographers I already follow on Instagram. I was so busy discussing this installation with Karen and acquiring very useful information on how to create pinhole images that I forgot to check the name of the photographer, which is really annoying. I think it’s from Pauline Woolley Large versions of pinhole images on the wall and a display of the cans that held the photopaper. I am now collecting cans to use as containers! A group of nine photographers who work together to make new work about the complex relationship between people and place. 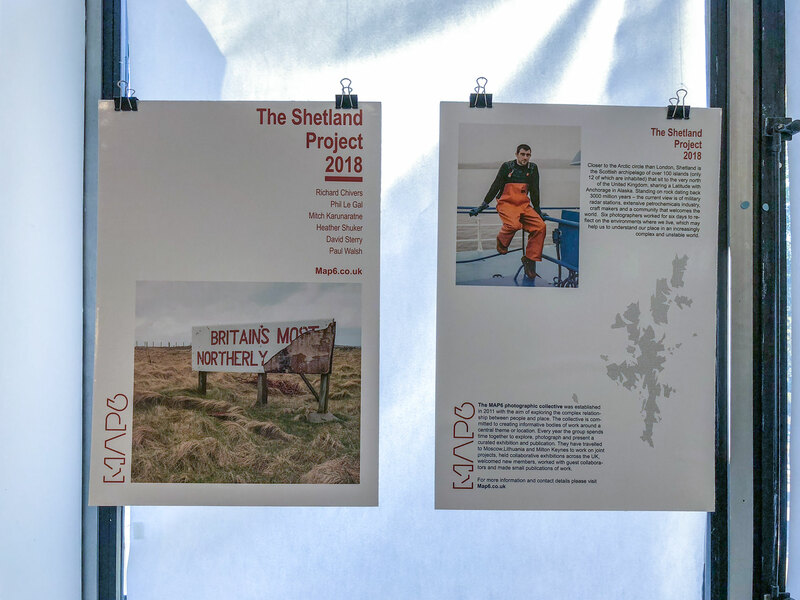 On this occasion they worked in the Shetland Islands for six days and I think the work produced is a wonderful example of the way in which collaborative projects can work – exploring the same place/location yet producing individual and distinctive interpretations of it. It’s the kind of project I would very much like to be involved with one day. This was a full afternoon with so much to see and absorb and I took much away with me about the nature of collaborative work presentation/installation and alternative processes. Still a late afternoon/early evening visit to come with a walk to The Regency Town House, Hove to see Tim Andrew’s Exhibition Over Hills and Seas, with a personal guided introduction by him. This entry was posted in 6. Phoenix Brighton 26th October 2018, Research and Reflection on November 25, 2018 by Catherine. Forest Glitch and David Cundy’s work both look really up your street. It’s such a shame I missed out on so much. Friday and Saturday were certainly quite different. I think the Friday ones inspired me the most in terms of process and presentation whereas the Saturday ones made me think more deeply on the concepts. It looks like there were really different displays this year, Catherine. I’m sure you got a lot out of it particularly with the infra red and the bonsais. That’s what initially attracted me when I saw them on the walls so it was a surprise (a pleasant one though) to read that they were pinhole. #silentpoolgin I enjoyed talking to Virginie this morning and hearing all about the distillery. #lumen Experimented with miniature prints today. When I laid out photopaper (mini expired Ilford glossy) I got some back to front but, strangely enough, those six still exposed but paler.